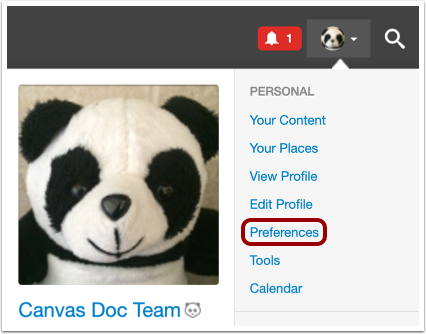 How do I set my user preferences in the Canvas Community? You can change your user preferences to manage all aspects of your community account. You can also manage custom activity streams in your user preferences. In the Canvas Community Navigation Menu, click the user menu. 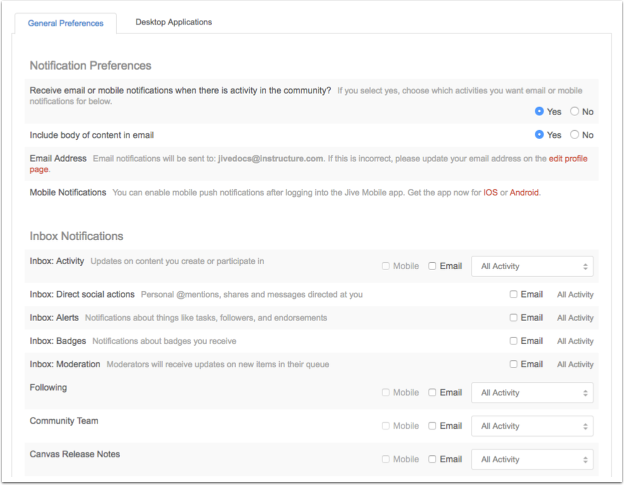 In the General Preferences tab, you can manage Email Preferences for various aspects of your Inbox, Moderation settings (if applicable), Connection Stream, and any custom streams you created for your account. You can also choose how often you want to receive a summary of all community activity, and whether you want to include the body of the community content in the email. Be aware that email content may not format correctly as shown in the online version. You may prefer to read content in the community instead of your email. Note: If you change the Receive email? option to No, email will be disabled for all communication channels. You can also set general preferences for your account. Hidden activity rules are set by the community administrators. If there are any rules that can be set regarding hidden activity, they will be displayed here for you. If while searching you don't want the community to display your history or bookmarks, select the Don't show checkbox. Set your preference for discussions and comments. Threaded means that all discussion replies and comments are organized according to the post where the reply or comment originated, showing a hierarchy of posts in an indented style. Flat means that all posts are lined up with no indentation, and all replies and comments are numbered according to their post order. You can also set your preferred language, date formatting, time zone, and whether you want to enable a high-contrast color scheme. Previous Topic:How do I add skills and expertise to my Canvas Community profile? Next Topic:How do I manage my inbox in the Canvas Community? Table of Contents > User Account & Profile > How do I set my user preferences in the Canvas Community?